Jazz saxophone legend Joe Lovano returns with Marilyn Crispell on piano and percussionist Carmen Castaldi on Trio Tapestry, a fascinating exercise in improvisation which you may find yourself returning to as it’s very addictive. The album opens with the sound of a gong played by Lovano himself, a resonant and indeed refreshing sound that seems to locate the record, center it or anchor it somehow in our consciousness as something oriental, even mildly inscrutable. 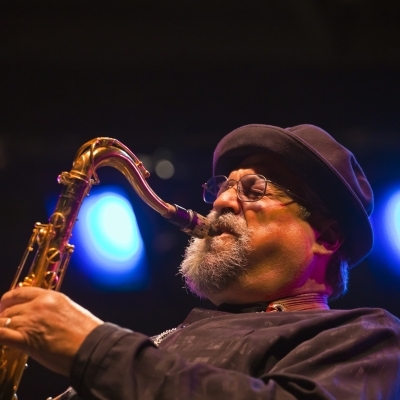 “I started to develop that concept back in the 1980s, playing tenor saxophone and accompanying myself on gongs, having a mallet in my right hand to create different tonalities and different key centers from which to improvise,” declares Lovano. The gong is by way of introduction to track one, “One Time In,” ushering us towards the subtle weaving of Trio Tapestry. The trio comprises Marilyn Crispell on piano, who first performed with Lovano in the mid-Eighties, and the drummer and percussionist Carmen Castaldi. Castaldi began playing with Lovano when they were teenagers in Cleveland. Later they attended Berklee College of Music together but in the mid-70s Joe relocated to New York while Carmen moved to the West Coast. Since Castaldi’s return to Ohio, the two friends have revived their friendship.